Relatively few Americans had personal experience with dating online when Pew Research Center first asked about it in 2005. Today, 15% of Americans say they have ever used an online dating site or mobile dating app – and one of the largest groups using online dating are Americans who have never been married. 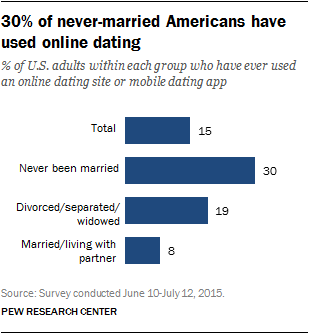 Some 30% of U.S. adults who have never been married say they have ever used an online dating site or mobile dating app. But it is not just never-married Millennials who are using online dating: 31% of never-married adults ages 35 and older have used an online dating site or mobile app, similar to the share (29%) of never-married 18- to 34-year-olds who have done so. Indeed, an increasing number of Americans of all ages have never tied the knot. The share of Americans ages 25 and older who have never been married rose to 20% in 2012, up from just 9% in 1960, according to a 2014 Pew Research Center report. Looking beyond the never-married population, 19% of those who are currently divorced, separated or widowed report ever using online dating. On the other hand, relatively few Americans who are currently married or living with a partner have ever had experience with online or mobile dating tools; just 8% among this group say they have ever used dating sites or apps. But in contrast to the never-married, younger adults (those ages 18-34) who are married or living with a partner are more likely than their older counterparts (those 35 and older) to say they have used online dating (14% vs. 7%). Although Americans who are in a committed relationship were not asked how they met their partner in this current survey, a 2013 Pew Research Center survey found that only 5% of Americans who were currently married or in a committed relationship said they met their romantic partner online.